– Neither Verizon or AT&T had great signals but we were able to manage working and making calls during our time here by using a booster. Without a booster, the signal was unusable. Our friends, RV Outlawz, had surprising success using their T-Mobile line. 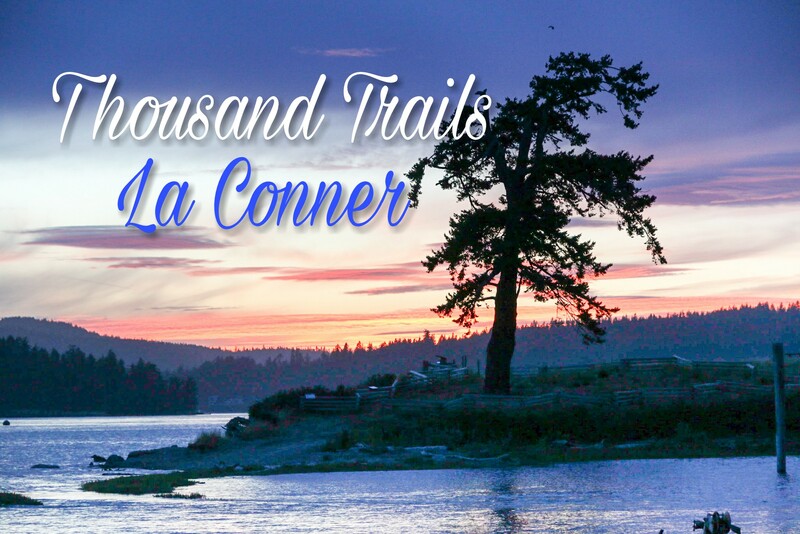 Notes about the surrounding area: La Conner is a charming Pacific Northwest town with a population of about 900. It is located ~10 miles off of I-5 in Skagit County with Seattle being about an hour and a half drive South (depending on traffic, that is). We ventured to downtown La Conner on several occasions and were quite impressed by how many restaurants and shops there were for such a small town that includes a boardwalk area if you’d like to take a stroll by the water. 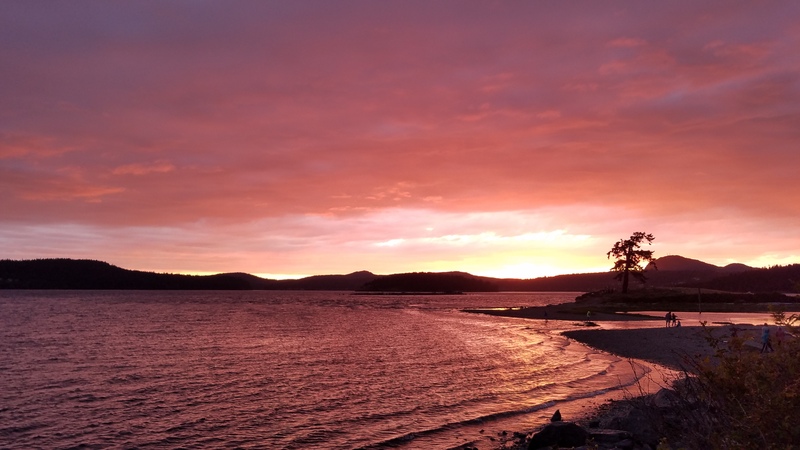 There is no lack of things to do in the surrounding area as the town of Anacortes is a short drive away as well as Deception Pass State Park which has several trails and a rocky beach! There is a post office and grocery store located in downtown La Conner but beyond those and the local shops, you would have to go to Anacortes, Burlington, Bellingham, Oak Harbor or Everett for your shopping needs! -Calico Cupboard is a local gem in La Conner and they have several locations throughout the area but we only visited this one (downtown). It offers a unique menu of breakfast/brunch/lunch items along with coffee, pastries and baked goods. We ended up going here on three separate occasions! We can’t resist a good breakfast! Their cinnamon rolls are also out of this world! -RockFish Grill is a brewpub located in downtown Anacortes with a nice menu selection that includes fish and chips, flatbread pizzas, burgers, etc. We dined here on two occasions and enjoyed our experience both times! -Coconut Kenny’s in Anacortes is a local chain of pizza joints with a decent selection of specialty pizzas! We are into the unique pizza topping combos and sauces so this was right up our alley and they also have decently priced daily specials. -Trainwreck is located about 20 minutes away via I-5 North in Burlington. We saw the reviews and had to squeeze in a trip here. They offer a versatile menu with burgers, seafood, sandwiches and a decent selection of craft beer. Next time, we will stop by for their brunch to try that beast of a bloody mary! 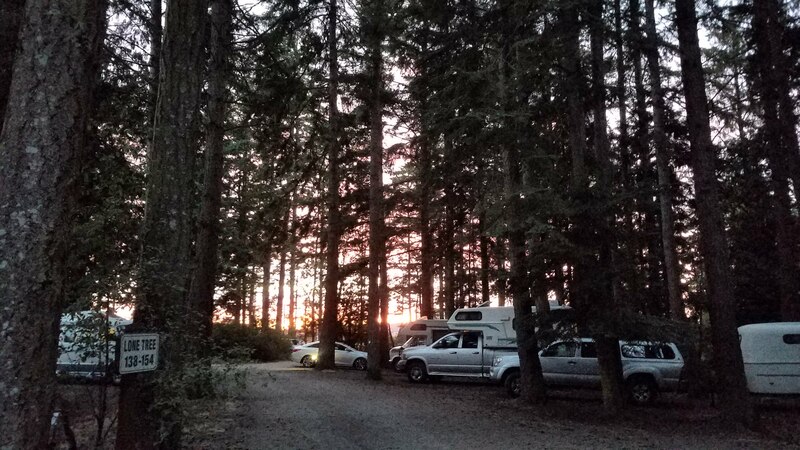 Particular notes about this campground and/or sites: La Conner RV & Camping Resort has 316 sites and is located right on the Puget Sound. They offer a very small number of full-hookup sites and the ones that free up are given out every morning by lottery. (Sidenote: we were actually never told about the lottery but we read about it in the paperwork we were given at check-in.) The rest of the sites are 30 amp with water and they do offer a honey wagon service for a $25 fee. There are two dump stations located at the entrance of the park. We found the campground itself is a bit hilly and the majority of sites are tight and not big rig friendly. There are several waterfront sites but they also are available via a lottery system and are VERY popular. Amenities: The amenities here at La Conner were about average for Thousand Trails but they do have some worth mentioning. They have 3 great pickleball courts which is always a plus for us pickleballers! We were told by some of the regulars that they had just finished resurfacing them and we were impressed. They also have a decent mini golf course, sand volleyball court, shuffleboard, laundromat, activity center and store on site. Breakfast, lunch and soft serve ice cream is available a few days a week and the store has campground-related merchandise and some camping essentials. If you’re visiting with children, there is a nice playground for them to expunge some energy! There is a large hot tub that would be perfect for watching the sunset over the Sound, but it has been out-of-order for a significant amount of time and it did not look any closer to being open by the end of our stay, unfortunately. That was quite a bummer! Also, the activity center claims to have Wifi but we tried on several occasions to connect and never were successful. Worth the mention here is the convenient boat ramp and beach areas at La Conner. 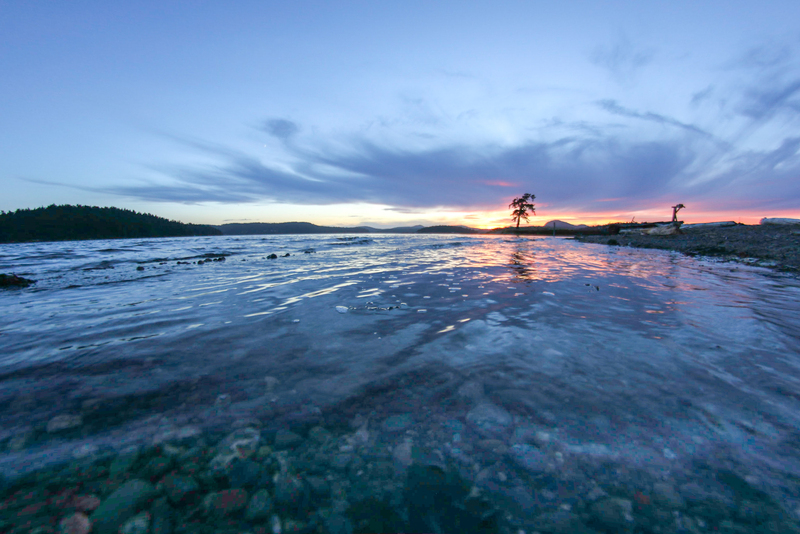 Plenty of spots to take a walk, spend some time on your kayak/SUP and enjoy the beauty that surrounds you. Our experience: We thoroughly enjoyed our time here and would absolutely visit again! Ryan was actually stationed at the Naval Air Station on Whidbey Island, which is a short drive from La Conner, while he was in the Navy, so it was quite nostalgic for him to return. The weather was fantastic with highs in the 70’s, plenty of sunshine and the perfect amount of coolness in the evenings. We did run into some trouble finding a spot when we first arrived. After well over an hour of searching, we ended up getting frustrated and parking in an empty spot that was so tight we weren’t able to extend our slides. We tried not to let that discourage us as we had been looking forward to visiting this park for quite some time. Luckily, the next morning a private spot opened up right by the pickleball courts that we were able to snag! Keep in mind, if you are in this area by the playground and pickleball/basketball courts, there will be a significant amount of noise throughout the day. Par for the course though! Seeing as how our stay was in the middle of the ~3 month window of perfect weather they have each year, it was quite busy during our stay. We were able to enjoy most of our time here with another full-timing couple, which is always nice to be able to share in the new experiences. We all decided to head to Deception Pass one afternoon and we recommend doing the same if you enjoy a very modest hike that has some great views. We found ourselves walking most evenings to the beach area to view some of the most amazing sunsets we have seen in quite some time! This was a real perk for us to have such a beautiful view within a 5 minute walk of your campsite so we definitely took advantage of it! Another adventure we didn’t want to pass up was a day trip to Seattle! Kim had never visited before so I was kind enough to navigate the traffic on a beautiful Saturday afternoon for her to experience the tourist trap that is…Pike’s Place Market! We are both not huge fans of crowds so this was a stretch for us! Although we did not participate in the infamous “fish-catching,” we did observe a few tosses and left with some smoked salmon. While taking a stroll, we did happen to walk by the original Starbucks, which was a lot smaller than we anticipated. The massive line might have influenced our perspective a bit though. Overall, we are glad we decided to make the trip and recommend the experience for those that have never been! Saving the best for last, this post would not be complete without sharing an amazing experience we were lucky enough to share with our friends one evening. We went on a whale watching excursion! Thankfully, Groupon had a deal going on for half off and we quickly decided this was something we had to do. We went with a sunset cruise (5:30-8:30pm) and tried to keep our expectations pretty low as not to get our hopes up. As we set off into the Puget Sound, our awesome Captain gave us a run-down of what to expect and even educated us on the marine life we were about to encounter. After a short 20 minute journey, we spotted some sea lions basking in the sunshine on a small rock island and, much to our delight, we were able to catch a glimpse of our first Orca! This turned into a solid hour and a half of following this particular transient pod during an evening feeding. It was an absolutely amazing experience to be so close to these beautiful creatures in their natural habitat instead of through glass in an aquarium. 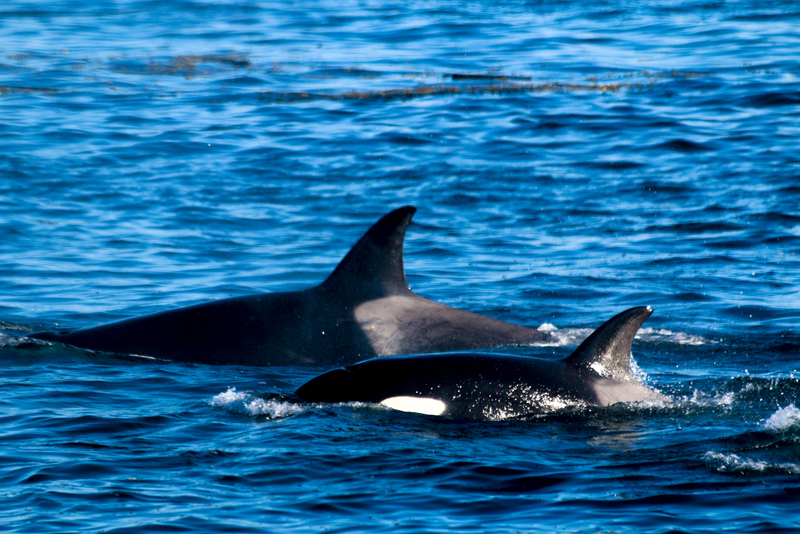 We were also lucky enough to be able to hear these Orca’s communicating by means of a hydrophone, which we’re told was a rare experience for this particular pod. 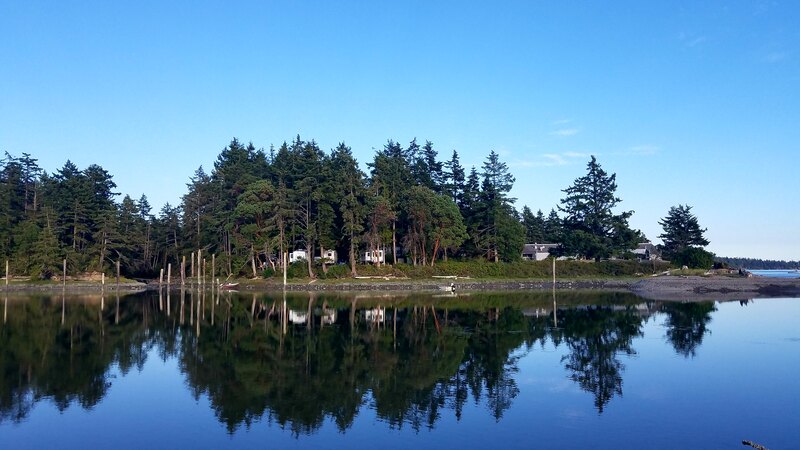 As the sun was approaching the horizon and we headed back to dock, our Captain was nice enough to take us into Deception Pass for a new-to-us view. During this time we were able to spot a pair of bald eagles perched on a tree near the shore. Overall, this was one of the best experiences we have had since full-timing! We HIGHLY recommend checking out Outer Island Excursions if you are in this area as they have numerous departure points. -Dust! Much like our experience at Bend-Sunriver, La Conner dust accumulation is just as annoying. Our neighbor was nice enough to spray the road with water numerous times, which does help tremendously. -Cell reception is something that allows us to keep living this amazing life and, unfortunately, we aren’t able to “disconnect” when an area doesn’t have decent service so this was also a negative for us. This was the first time we used the WeBoost though and we noticed a big difference! -La Conner does not accept any packages for campers. Again, as full-timers, this can be extremely inconvenient when you are somewhere for 3 weeks. We were able to make friends with one of the local post office employees though as we made several stops there over the course of our stay! -Being without sewer is also not a plus for us, although we are getting used to it as we experience more of the PNW Thousand Trails! We actually made it through our entire 21 day stay without dumping – a new record! Despite these factors, we really did enjoy our stay here! It is hard not to when you are surrounded in some of the most postcard-worthy views and have a couple of friends to have fun with! ⟵Two Years In: What’s Happening Now! ?